Out of everything I’ve learned from my friends about weddings this year, the most important is that they are expensive (as in, I should probably start saving now and put my credit card in the freezer). The second thing I’ve learned is that it’s all about setting the mood with your décor of choice, and wedding table decorations happen to be a huge part of the reception. Forget traditional floral arrangements because what’s in vogue is much more elevated than what was popular then and even a few years ago. Our favorite modern styles range from Grecian arches to delicate garlands of greens to lanterns strung overhead. It’s not just about centerpieces anymore—tablesetting touches and overhead decorations are also part of the overall picture. So let us introduce you to the seven new reception centerpiece trends all the cool girls have at their weddings. A fresh, modern take comes from matching your table settings to the centerpieces. In this instance, a small vase of white flowers in the middle of the table plays up the sprigs of greenery wrapped around guests’ napkins. Simplicity is key here, with burlap ribbon details further tying back to the natural theme. Have a strict budget and need to forgo blooms? It’s no big dea—we promise. Let wisps of elegant greenery snake around the champagne glasses to form a pretty work of art on the table. We don’t know about you, but we’re digging this A Midsummer Night’s Dream vibe. They call it mood lighting for a reason: Scatter candlesticks of different heights around a peony garland in the center of the table. Look for candlestick bases in the same tone but with varying details like cutouts and bevels. This is especially a great idea if you’re hosting your affair outside—you’ll get a great glow as the sun goes down. A touch of simple greenery laid on the table runner perfectly balances out strings of twinkle lights and hanging lanterns above your guests’ seats. Wrap the poles holding the decorations in sheer tulle to go along with the theme. When it comes to the lanterns, choose alternating geometric shapes to create a whimsical air that feels straight out of a fairy tale. To avoid spending a ton on flowers, scatter a few simple vases along your tables, and make the focal point wreaths of greenery hanging from your tent or ceiling. Word to the wise: If you go for larger silhouettes, you won’t need as many to fill the space. Have you ever been a guest at a wedding where the floral centerpieces were too big or tall to see the person across from you? The good news is you can get the same wow effect with these gorgeous raised arrangements with cutout wooden bases without having a visibility problem. When alternated with lower matching arrangements in glass vases, the effect is beautiful. 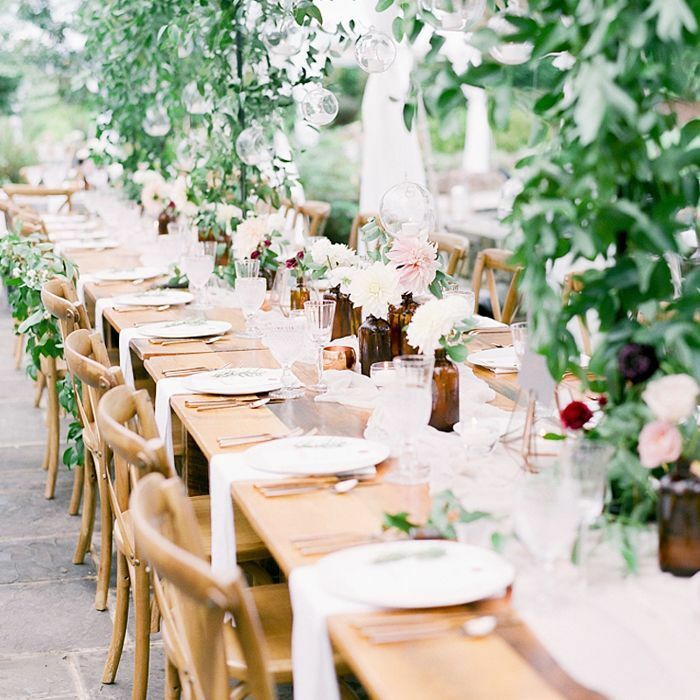 Now, these are wedding table decorations that we’d want to take home with us. Veer away from traditional hues with something bold and beautiful—like exotic blooms in red, white, tangerine, and shades of pink. Let low yet expansive bouquets cascade over the table settings for a romantic and organic feel. What are some of the best wedding table decorations that you’ve seen lately? Share your favorites with us in the comments. Up next are the three questions you should ask before getting married.